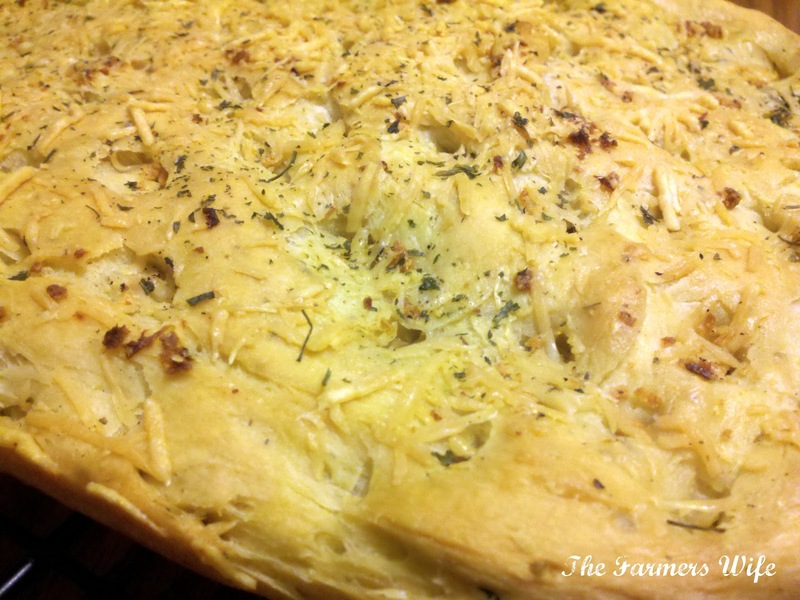 If you've never had Focaccia bread, you really must give this a try. For those who may not know what Focaccia is, let me explain. Focaccia is a flat, rustic Italian Herb bread. Now I've seen some that are thicker than mine turned out, but traditionally it is pretty flat. I love me some garlic bread, like seriously. I'd be happy to just sit and eat that all by itself, but I've had a love affair with Focaccia for several years now. There's something so... almost elegant to eat your pasta with a side of Focaccia, especially when you just tear a wedge off... So yum! I will tell you that since making this, I have had all sorts of ideas run through my head as to different variations I can make upon this, and next time I make my Pasta with Roasted Red Pepper Sauce, I think I may add some of the roasted peppers to the bread itself, doesn't that sound good?!? I have to admit, I was a little surprised at the simplicity of this recipe, and once again all 3 of us just loved it! In fact if I remember correctly my hubby even enjoyed it as a midnight snack... haha! It reheats beautifully, and is a great change from the typical garlic bread! Place dough ingredients in bread machine, in order listed or as recommended by your manufacturer. Use your machines dough setting. Grease a 12-14 inch rectangle pan, using your hands gently stretch the dough and press it evenly into the pan. Cover and let rise in a warm oven for about 30-45 minutes until doubled in size. *Tip to warm your oven, turn it on to 200F degrees for 1-2 minutes, then shut off and place pan in there, take the bread out before preheating the oven. * Once the dough has risen, remove from the oven, and preheat to 400F degrees. With 2 fingers, poke holes all over the dough. In a medium bowl, combine olive oil, garlic and pepper; drizzle evenly over the top of the dough. Sprinkle with the cheese and parsley. Bake for 25-30 minutes, until golden. Remove from the oven, and you can cut it into squares are tear off wedges, serve warm. Once cooled, wrap in plastic or foil. The bread will stay fresh for 2-3 days stored at room temp. This is a pretty basic version, but seriously packed with flavor! You can totally mix it up and add sun dried tomatoes, or roasted peppers, or pretty much whatever you want! I can't express enough just how much we enjoyed this bread. It was a really nice change from our normal Garlic bread! 5 stars. Oh this sounds good. I absolutely LOVE using my bread machine. It makes it so much easier for me and I've never tried to make focaccia in it. So excited to give it a try! I almost every kind of bread and this looks so good. Thanks for sharing. I've been excited to try baking new breads lately. I will surely try this. I love Focaccia Bread! This looks great. Yum! LOVE Focaccia bread. My recipe is slightly different and I also use it to make pizza crusts and calzones. I also posted on focaccia bread a few weeks ago. I love baking up a batch- it's the perfect canvass for almost any herb or vegetable.Your version looks great! This bread looks super yummy!